We wish to present you the review of Epson Expression Premium XP-600 вЂ“ a new creation of Epson Company. Printing of high quality, as well as the function of wireless connection makes operating with Epson XP-600 more easy and comfortable. This model is able to execute functions of copier, scanner and printer and does any office tasks perfectly despite its small size. Epson XP600 is good for all people who are fond of qualitative color photos with 5760 x 1440 dpi resolution, bright and contrast colors can compete with any modern photo laboratory. The mentioned list of Epson Expression Premium XP-600 benefits is not exhaustive as the printing device has even more positive characteristics. Additionally, we should also mention high level of automatization of the multifunctional printing device. For more convenient operation with printer Epson XP-600 it is equipped with handy wireless connections, which combine embedded Wi-Fi and Bluetooth modules and offers wide coverage at high speed. Simple wireless connection settings give you an ability to connect to a network in a moment. Printing with XP600 Epson becomes possible from any place and computer at home. This kind of printing devices, Epson Expression Premium XP-605 among them, support Epson Connect system, so you are able to make remote scanning or printing of the documents. Due to the Epson iPrint application it becomes possible to print from tablet PCs, mobile phones or any other devices based on Android or iOS. The Epson Email Print function (so-called "cloud printing"), lets you to print with printer Epson Expression Premium XP600 throughout e-mail. Also the availability of a color LC display with sensor-touch panel having size of 6.3 cm is very important during the device work. Now you can edit and view the photos printed on the screen directly. Operating with the model XP600 Epson is more than simple, the applications installation will take just minutes and no efforts at all, so you will enjoy the high-qualitative of printing. Traditionally for all inkjet MFDs made by Epson Company, the base of the multifunctional printing device XP-600 Epson is the piezoelectric ink laydown technology, which ensures high quality of prints with precise color rendering. Furthermore the undeniable advantage of this method of printing is the shape and size of the droplets applied at the accurate position on the sheet of paper. At high-speed printing droplet retains its usual spherical shape, which is turned into a dot on the sheet of paper. The main part of the Epson inkjet printers is the printing head of new generation вЂ“ MicroPiezo. It uses a multilayer piezoelectric element with only 20 micrometers thickness. It is worth noticing that the MicroPiezo printing head is known by its durability, prolonging the life of the multifunctional printer even with intensive use. This technology of printing has several advantages thanks to which either Printer XP600 or Epson Expression Premium XP-700 will glad you with its reliable and good work for a long time. 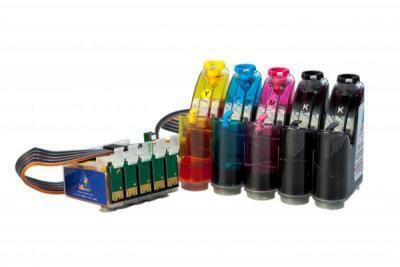 The main problem of all inkjet devices is the high price of original consumable materials. Printer Epson Expression Premium XP600 with CIS system saves in more than thirty times on printing, as the user will have no need to change the expensive original cartridges anymore. In CISS ink is supplied to a cartridge constantly, and all actions needed − is to refill the ink tank according to its actual flow. INKSYSTEM Company offers qualitative and reliable Continuous Ink Supply System with a year warranty. So, the printer Epson XP-600 is not only high qualitative and comfortable printing, but thanks to the installed CIS system it means reliable and economical work of the entire device. A4 print speed - black text: 32ppm (pages per minute). A4 print speed - colour text: 32ppm (pages per minute). Prints a 10 x 15cm (6 x 4in) photo in 20 seconds. Card slots: Memory Stick (MS), MultiMediaCard, SD card, xD picture card. 6.3cm LCD touch pnael display. Compatible with OS X v10.5 and higher.